If I find anything Adventure Time related, you can rest assured that I will post it. Or buy it. Or at the very least light up in response to seeing it. I even have Adventure Time earrings. One is Jake and one is Finn. 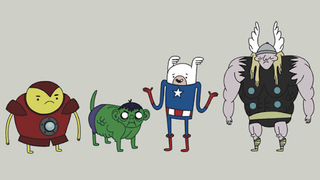 So this week's best image is an ode to The Avengers, in the style of Adventure Time. And it is delightful. And it's even a t-shirt. Thanks to InsanelyGaming for the great find. If you want to see the list of nominations (and other random conversations) you can head to my most recent nomination post that goes up every Friday here. E3 is over and I&apos;m exhausted and gimme your comment of the week. Okay, they're... they're showing Halo 4. The demos keep showing sequels...Uh, I think they're...they're talking about a browser or something. I-I don't know, I wasn't listening... Nothing's happening. Nothing's happening. Usher's dancing. Nothing's happening. It's over. A lot of people in the audience look pissed. amazingmao also wins for making somewhat of an unfair comparison. Snooki?! Come on. Just imagine your favourate thing, essentially destroyed, nullified, without the possibility of continuation, replaced with something new that you absolutely can't stand. Imagine the American Flag design, replaced by a picture of Snooki, forever. The Wii U GamePad Is Different. Here's How. You Can Turn Into a Cloud of Bats in Skyrim's Dawnguard Expansion. Bats. You Can Turn Into a Cloud of Bats in Skyrim&apos;s Dawnguard Expansion. Bats. Bees? No, not bees! Bats! E3's Unsolved Mystery: Are Watch Dogs and Star Wars: 1313 Really Next-Gen Games? E3&apos;s Unsolved Mystery: Are Watch Dogs and Star Wars: 1313 Really Next-Gen Games? Are we actually seeing PlayStation 4 and Xbox 720 video games at E3 and no one&apos;s admitting it? Microsoft Wants to Stream Console Games to Phones, Turning Handhelds Into "Xbox Live Companions"